Not too long ago I had a customer who hired me to do an assessment of their front line sales managers. The owner wanted me to provide objective feedback on the effectiveness of a few of their Branch Managers including their ability to coach and develop talent. I kicked the process of with an introductory phone call to make introductions and properly set expectations at which time the manager shared with me "I provide coaching all day, throughout the day. My coaching is very hands on and in the moment." I said that is awesome, I look forward to working with you and seeing you in action. When I arrived in the office however I discovered that this manager, like many managers, believed that the purpose of sales coaching was to correct negative behaviors by telling their reps or recruiters what they did wrong, in real time. He would say "do more of X" or "stop doing Y." Many sales organizations have invested more time, money and effort over the past few years training their managers to improve their coaching skills then they did in the previous 25. This makes perfect sense when you consider a recent report conducted by the Sales Executive Council shows that no other productivity investment comes close to improving sales performance than sales coaching. There are managers who coach and mentor their employees and there are those who don't. Sales and Recruiting managers who fail to coach are not necessarily bad managers, but they are neglecting an amazing opportunity and a proven tool for developing and retaining talent and accelerating the growth of their business. I've worked with hundreds of IT staffing leaders over the years and have observed what distinguishes them from managers who fail to coach. What has stood out in my dealings with these leaders who do coach is their attitude and mindset: They simply believe in the value of coaching. They think of their role as a manager as less about managing process, and more about increasing the value and self-worth of their employees. Coaching is a natural part of their "managers tool kit. Keep in mind, these are not professional coaches, they're front line managers who manage a group of sales reps and/or recruiters, they have their own book of business and they're crazy busy, hard-working people like every other manager. So why do they consistently commit to making the time in their daily schedule to coach their direct reports? Here are four reasons why managers should dedicate time to coaching. Frequently I get asked by customers and industry colleagues, "Dan, what are the trends you're seeing in the marketplace?" 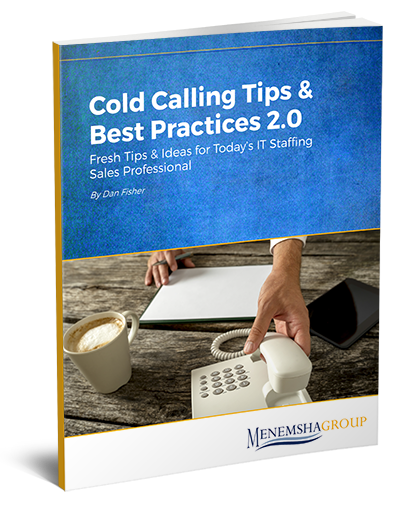 "Dan, what are some of the best practices you see high growth IT staffing firms adopting? "What are the common characteristics shared across high performing sales teams?" While I wouldn't say there is one specific characteristic or best practice, there is however a growing trend. The trend I'm seeing with many of the most progressive staffing CEO's including the fastest growing IT staffing companies is they're adopting sales enablement as a formal business practice. While this has been a common business practice in other industries for years, only the truly commited, the early adopters, seem to be incorporating sales enablement as a formal business practice in their staffing business. As I wrote in a previous blog, there seems to be much confusion over what sales enablement is and why it matters.